One of the earliest wild flowers of spring, Coltsfoot is very easy to identify. It’s a member of the Asteraceae or Composite family, and the bright yellow flowers look a bit like miniature Dandelions, to which they are related. Each flower grows on its own separate stem, but unlike Dandelions the stems are scaly and the flowers appear well before the leaves so that they sometimes seem to grow straight out of bare earth. Later on, the seeds are borne in clusters of white “parachutes” similar to Dandelion clocks but smaller, silkier and more densely packed. The leaves tend to appear when the flowers are starting to go to seed, and their horse’s hoof shape gives the plant its English name. At first they are covered in a downy white membrane that wears off the upper surface as it expands, but remains as a felty coat on the underside. In the days when playthings were in short supply, children made “picture frames” and “mirrors” by rolling the membrane back to frame the glossy centre of the leaf. The scientific name is made up from two alternative Latin words for the plant, but the first of them comes from tussis – a cough. 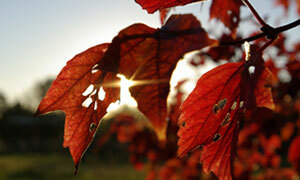 The Romans used the leaves as an inhalant, and in England it was often used to make cough syrup. Like a lot of traditional remedies, it has been found to have active ingredients which are useful but potentially harmful taken in large or concentrated doses. 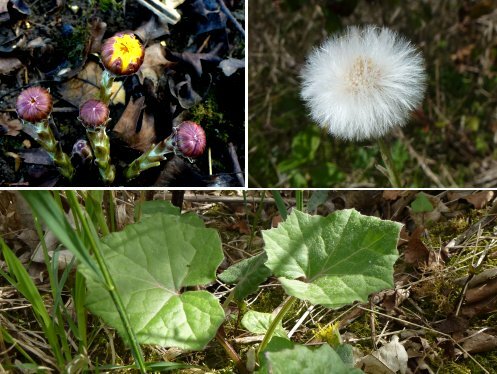 However the Coltsfoot Rock that some of us remember from childhood is still made to a secret recipe by a manufacturer in Lancashire, and is perfectly safe to eat. At St Nicks, Coltsfoots generally start to flower at the very end of February. This year we recorded our first flower just beginning to open on 25th February, and by now it’s easy to find them along the woodland path edges. Unless the weather turns particularly warm, they should last well into April, and the leaves will be there till mid-autumn.